questions from general studies, 30 questions from arithmatic skill and 10 questions from logical skills. the maximum time allowed will be 120 minutes. 1) General Studies : - Paper consist of 60 Questions of 60 marks . This section covers 60% part of total paper. 2) Arithmetic Skills : - Paper consist of 30 Questions of 30 marks and covers 30 % of total marks. 3) Logical Skills :- Covers 10 % of total marks, 10 Questions of 10 marks . * Previous papers attached in ATTACHMENTS. You must passed your INTERMEDIATE from AP state board. Your age must lies in between 18-34 yr (39 yr for SC/ST). why the vro question paper can't be english? sir some r saying only will b in telugu language and some r saying it will b in both the language. can any one give the clarity 4 this question?? SIR, WHETHER VRO EXAM WILL BE IN ENGLISH OR ELSE IN TELUGU LANGUAGE? i'm a english medium student i want to know whether vro exam is in english or in telugu language any one tell me correct information please. vro question paper will be in english or in telugu? - The vro exam is for AP state. - The candidates who are not native of Andra Pradesh are not eligible for VRO exam. - The local candidates will give the exam so local language will be used. - So the exam of VRO will be in TELUGU language/medium. New exam date- 19.02.2012 fixed. 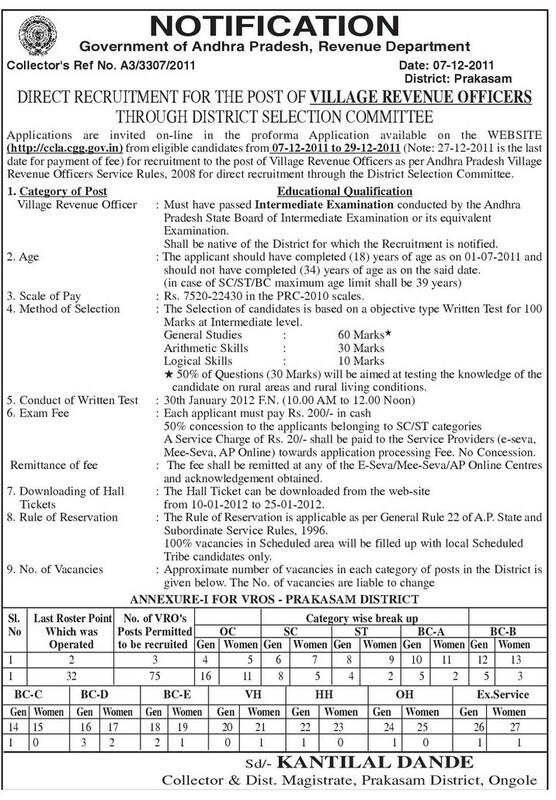 Since the VILLAGE REVENUE OFFICER ( VRO ) post is belongs to pure ANDHRA PRADESH. So,the exam is basically conducted through only in TELUGU. While preparing prefer only telugu. Preparation is GENERAL STUDIES ,ARITHMETIC & LOGICAL QUESTIONS.